Can this 50-watt integrated amp match the wonderful Cantata CD player? Last year we had some bad news. Resolution Audio discontinued one of our favourite CD players, the Opus 21. The good news, however, was that it replaced it with the Cantata Music Centre, which went on to win several Hi-Fi Choice awards in the 2010 Awards issue. Now we have the follow up, a Cantata amp in a matching box, containing a British circuit design and a less-is-more ethos. The 50 suffix indicates power output, making this the least powerful solid-state amplifier we've seen at this price, so what gives? Resolution Audio built the Cantata 50 to be a less speaker-sensitive/more powerful version of its predecessor, the Opus 21 s30 amplifier, and has achieved this by giving it a larger power supply. 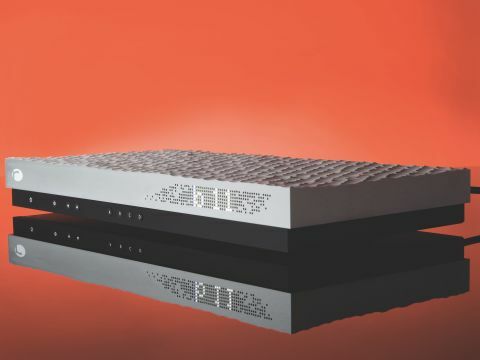 The new amp has four, rather than two T-network capacitors, a mains transformer that's 60 per cent more powerful and a significantly bigger heat sink – the top of the casework is solid aluminium and performs this function. Why does the heat sink change things? Because it allows the FET output transistors to be run at a higher bias and this means more power output. The Cantata 50's speaker terminals are a little different. They feature a third terminal for earthing the amp to the speaker, something that DNM Reson cables are designed for, if not many loudspeakers. It requires the speaker to have an internal connection to the drive unit baskets, which are electrically floating. Tannoy has included earth terminals on some of its speakers, because the earthing idea comes from Japan, where the Scottish company has a strong following. The speaker terminals are in socket rather than binding post form to keep the metal content down in true DNM style. Resolution Audio has not gone to the extreme of using Perspex casework, but does have aluminium oxide spacers on the FETs attached to the heat sink, in order to minimise eddy currents that are induced in metal if there is an AC field nearby. The Cantata is a class A/B integrated with only four line inputs (the Music Centre augments these with digital inputs). These inputs are indicated by a letter that shines through the attractively retro-style dot matrix display alongside the volume level. We were a little perplexed that the amp on the promo picture shows a capital letter, whereas our sample displays a lower case one. But it turns out that you can dedicate one input to the Cantata Music Centre, which gives it priority over other inputs and displays as a capital for that reason. Input selection and volume control can be accessed from the front panel, but the system remote is an easier option. The volume control is a switched resistor network much like that in the Music Centre, but when the two are used together (and we suspect that this is a good idea) the volume control in the player is bypassed. You need to connect the two units with a bus link to achieve full functionality. The most distinctive thing about this amplifier is its beautifully machined shell. This stunning piece of industrial design makes the Cantata products stand out a mile. If there were any justice in the world, then this amp would be on the front of the finest design magazines in the land. It probably also accounts for a fair portion of the final cost, but when you consider its sculptural qualities, it's money well spent. Build quality is very high throughout, not only is the machining on the shell itself state-of-the-art, but the buttons, display and connections are all top notch. It's not a big amplifier, width is about average but height and depth are petite, continuing the less-is-more theme. The speaker terminal sockets are deliberately minimalist and, therefore, don't look very classy, but there is the option of having conventional binding posts, too. In terms of value, it's not so obvious what you're paying for apart from the casework, at least until you plug in a great source and speakers and spin some choice tunes. Try as we might, we couldn't think of an amplifier under £6,000 that comes close to the musical transparency on offer here and that equals great value in our book. The Cantata Music Centre made a big impression and so expectations were high for the partnering amp. As it turned out, they weren't high enough – this is the most musically engaging amplifier we've heard in a long, long time. It's hard to pin-down exactly what it does that's so effective but it is incredibly fast; it doesn't increase tempo but it just stops and starts like quicksilver. It also makes most amps sound badly time-smeared and sluggish. This is partly because it's not a powerful-sounding amp – it can deliver good scale, but can't match the room-filling grandeur of real powerhouses. What it does instead is let you know precisely what's going on in the music, and if you liked that piece of music before, you will be charmed by it through the Cantata. The Opus 21 CD player proved itself to be extremely capable in this regard by providing the signal being amplified – we tried another player for size and quickly went back because this amp is so revealing of a source's capabilities. On the other end of our Townshend DCT cables was a pair of PMC fact.8 speakers, an 89dB sensitivity floorstander that revelled in the Cantata 50's company. The way it reflects the original recording is quite startling, the speed factor means that transients can literally make you jump when they strike at the start of a piece. Instruments and voices also seem very real, it's much easier to understand lyrics and to appreciate just how dirty-sounding an electric guitar can be. More sophisticated material has a beauty that is totally beguiling, melodies are placed front and centre and the whole emphasis is on the music rather than the sound. Rather a lot of amplifiers work hard to deliver an impressive, rich and powerful sound that somehow manages to put the music in second place, but good sound alone is a novelty that wears thin. This amp is a tremendously effective communicator of the musical message, once an album is playing it's a struggle to take it off unless the house is on fire or you think of another album that can't wait. A good example of the sound/music conflict is Wyclef Jean's Thug Angels. This is a well-produced and substantial modern recording that can sound glorious with its fast bass line and multi-layered vocals. But, on most occasions, we only listen to the first minute and get the idea. Here we stayed for the full six-and-a-half and enjoyed them to the max, despite the lack of gut-churning bass. The Cantata 50 is a hi-fi product for the music lover rather than the audiophile. It provides a lot of what the hi-fi nut enjoys in its pacey delivery, very low distortion and densely packed detail, but it doesn't set out to wow with scale or power. Rather it concentrates on getting the music to the speakers without damaging its temporal or emotional integrity. It's also hi-fi for people with an aesthetic understanding and an appreciation of great design. You only have to look at it to realise it is a thing of beauty, far removed from the dumpy boxes we're so familiar with. Here's another winner from Resolution Audio, then. The bar has been set for 2011's amp newcomers.